- ever been unable to get your truck on the road as no one knows where the ignition keys are? - ever tried demonstrating a car without the keys? - ever been late showing a potential buyer or renter around one of your properties? The Key Management - mechanical plug-board system is a practical solution that will allow you to quickly and easily spot where keys are missing ...and instantly identify who has taken them! Keymanager is a proven key tracker and key control system which is a favourite with the garage and motor industry, vehicle fleet managers, police, estate agents, ...in fact anyone who needs an effective key control system. -Instant identification of non present keys ... and who has taken them! For each key (or bunch of keys) to be stored, the plugboard features a pair of linked key management slots, the first being a key "Retention Peg" slot, the other being an "Access Peg" slot (the Access Peg is also sometimes referred to as the release peg). Key Retention Pegs are numbered to match the numbered key slots on the board. Keys are secured to the Retention Peg with the special anti tamper seals provided and the Retention Peg locked into the board. Access Pegs are issued to each person authorised to remove keys from the board. 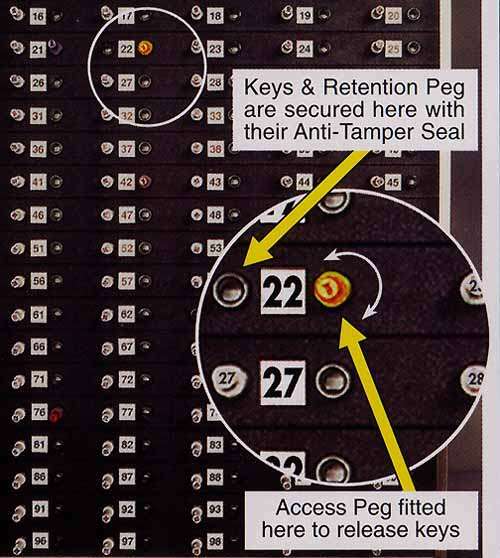 Details of who the uniquely identifiable (colour coded and numbered) Access Pegs are issued to, are recorded at time of issue. As a key Retention Peg with its attached keys can only be removed from the board by inserting an Access Peg (which itself is automatically locked into the board until the keys are returned), it is always possible to identify who has any missing keys by identifying who the Access Peg was issued to. 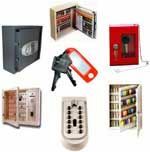 The wall mounted system offers a simple and practical solution for controlled key issue and key management. For many customers, a simple wall mounted plugboard system in its robust stainless steel frame offers the ideal key issue and tracking solution. Where key security is critical, the standard wall mount board can be installed within a robust, dual locking security cabinet, which is available as an optional extra. Access Pegs are supplied as standard in the ratio 1 Access Peg to each 5 Retention Pegs. i.e. 5 Access Pegs are supplied as standard with the 25 key plugboard system, 10 Access Pegs for the 50 key system, etc. (additional / replacement: `Retention Pegs` and `Access Pegs` are available for separate order as required). Because the system is modular, you can easily grow your system as your business need expands. Add key management modules (25 keys per module) as required. A secure key cabinet to house the pegboard system is available as an optional extra as required. This may be an insurance company specified requirement for certain types of application (i.e. motor dealer systems), or a practical measure where key security is a critical issue. A floor standing plinth is available to provide a secure mount for the security cabinet where wall mounting is not an option. - Lost a Retention Peg? 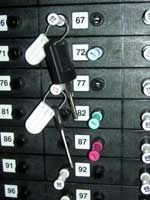 - A number of Key Access Pegs are supplied with your Keymanager system (in a ratio: 1 Access Peg per 5 Retention Pegs). - typically used by motor dealers for controlling the keys to their vehicles for sale. The numbered mirror hanger (which features the plugboard key number) clips onto the vehicles internal rear-view mirror.